Brodosplit, one of the biggest shipyard in Europe and the largest in Croatia, confirms the willing to enter the superyacht market with their second new build. The 60 meter cruise-superyacht Katina, custom built for her owner, is a four-deck displacing cruise-yacht vessel built in steel and aluminum. During the 2015 Monaco Yacht Show, Brodosplit brought to the exclusive public of the show the second of their pleasure yachts, the peculiar 60-meter megayacht "Katina". The designers gave Katina's guest three decks entirely dedicated to their comfort, relaxation and enjoyment. 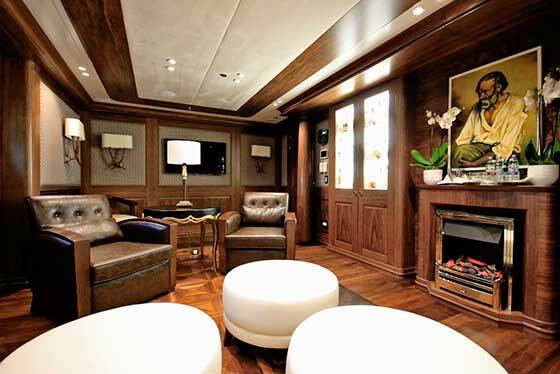 Aboard several unusual surprises, specifically wanted by the owner, such as a whisky bar or a room set up as a hospital. Everything has been conceived and designed to offer owners and guests a long run cruise surrounded by the most comprehensive entertainment and luxury, without giving up any comfort. With a length overall of 60 meters and a beam of 10.68 (draught is 3.10), Katina is a displacement vessel built in steel for hull and superstructure and aluminum for the superstructure. The rational arrangement on four decks, with the top-three fully dedicated to guests, and the wide beam layout without external side decks, make of Katina one of the largest yachts in terms of inner space, compared to the external measures. The interior design is by Turkish designer Ali Getz who, in accordance to the owner's indications, went for a linear yet extremely elegant pattern of light and dark shades, using satin oak, gloss walnut, cream leather and most noble fabrics. The main salon is a unique space, with large round relaxing area featuring a cocktail bar to port, two semi-circular couches and a hiding flat TV. Moving abow, the same pop-up TV is backed by a second, independent screen and partially separates the round dining table for 12 guests. A full-beam hall placed amidships is the proper access on board, thanks to the two side gangways and watertight doors, in a cruise-ship style. A center hallway leads to the elevator and to four rooms fully dedicated to guests: a gymnasium with sauna and shower, a whisky bar/cigar room with fireplace, armchairs, bottle cabinets and independent ventilation, a large day bathroom, and a fully equipped hospital room, with autonomous ventilation and power supply, hospital-like bed, private bathroom. Through the elevator or the rounded staircase, guests reach the upper deck, where six suites feature private balcony and en-suite bathroom. The two fore ones are 50 square meters large, and share a front-facing balcony hidden to the view of other guests and crew. The four, identical mid ones measure 40 square meters and have their own folding balcony that hydraulically opens on the side of the vessel (two per side). 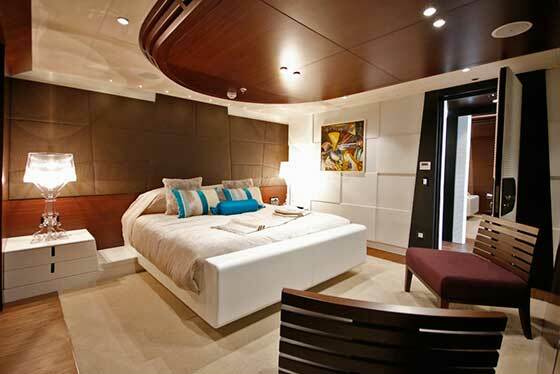 Each of the six cabins feature double beds that slide open to split into twin beds, vanity corner, "office table" with chair, and bathroom with marble and wood finish and floor heating. The two suites to bow both sport shower and separate bathtub, while the other four have a double-sized shower cabinet. A covered aft cockpit is a public outdoor area for better enjoying the sea. The sun deck boasts a huge, teak covered deck. While the back part hosts several water toys, including a rescue boat, a 170HP tender rib, a jet ski and more, the center part is dedicated to a raised Jacuzzi for 6. A wide awning electrically opens and closes according to guests desires. Under the covered part of the deck a grill bar faces a cocktail bar to complete the amenities. A center hallway gets inside the bridge and features another day bathroom, while the fore part is fully dedicated to captain with private bathroom, separate office and the wide wheelhouse. All the entertainment aboard can be controlled by tablet and smartphone devices, including heating, window shades, and lighting. A series of 30 RGB (red, green blue) underwater lights all around the yacht creates a spectacular effect while at port in the night. The lower deck host the technical and service areas including, beside the engine bay, a technical room, a laundry, the galley (capable of serving three hot dishes to 50 guests at once), and 10 crew cabins for a 13 people crew. A four-story staircase, fully independent from guest spaces, allow crew to move on board undisturbed. The lower galley and the main salon are connected with a dumbwaiter. Katina is propelled by two Cummins engines delivering 1000 kW (1360 MHP) each. Top speed exceeds 14 knots while cruise speed is 12. The range can reach 4000 nautical miles but especially 7 days of autonomy, considering the water reserve and galley / refrigerating capability. Two desalinators produce 9 tons of fresh water a day each, while power supply is granted by three 250 kW generators. Katina is fully compliant with "Unrestricted Service" certification for navigation, and can thus operate in any area and any period of the year. Four zero-speed stabilizers (two on each side) grant an oscillation within one degree around the axes, both at anchor and in navigation. Although among the most important products of Brodosplit are cruise ships, ferries, passengers vessels and merchant ships powered on alternative fuel, the Shipyard is specialized in "tailor-made" units: working with clients from the very beginning, they are able to implement a project according to very specific needs and desires of the shipowner. Everything from design to delivery is done within the shipyard. Getting a custom and sophisticated vessel within a short construction period is possible thanks to the expertise of the shipyard and a network of quality subcontractor companies, suppliers and associates. Among the state-of -the-art processes, we just mention steel working, painting and piping. A specific company named Brodosplit Interiors was established for interior works and employs both architects and production workers. The company provides full service design, CAD / CAM system with complete engineering and consulting. A strong design team, consisting of 250 senior designers in different positions, can fully cover concept design, project and workshop documentation. After the first stages, the design process continues with extensive tests at the scientific-research Institute of Naval Architecture in Zagreb. Brodosplit can build ships over 160,000 tons DWT (deadweight tonnage). It has two slipways: the first can be used for the construction of tankers up to 300 meters long and 50 meters wide, the second for building ships up to 250 meters long and 42 meters wide. In the last seventy years the shipyard has delivered more than 350 ships with a total of over 10 million tons DWT, with 80% of production made for the international market. Only in the last twenty years, ten ships from Brodosplit's slipways were chosen as the best projects in their categories. Brodosplit owns the record for the largest tanker in the world ever launched in one piece: a ship of 280 meters with 166,000 tons dwt. Since 2007 the company has the certificate of quality management system ISO 9001. 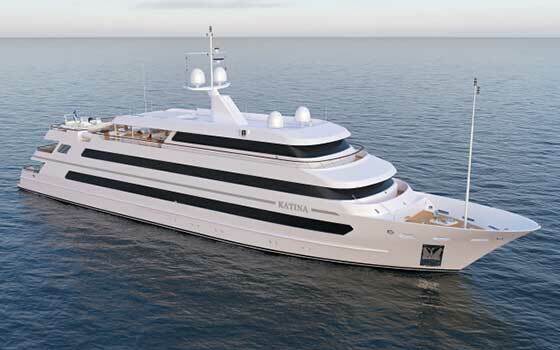 Within the superyacht division, after the delivery of the second unit "Katina" a third project is well underway. It is 74-meter pleasure unit currently under development, made under specification of her owner and with a totally different look when compared to the previous units. Best internal design capacities have been engaged, while one reputable yacht designer will additionally enrich the present design with some state-of-the-art ideas in order to be different and recognizable on the market. Brodosplit is part of the large DIV Group, active in many industrial fields and among the world leaders in fasteners, tanks, cranes, steel construction, railway supplies, wind turbines, energy and many more.